Mildred Evelyn Clark was born September 22, 1910 in Bridgeburg, near Fort Erie. When her mother died and her father remarried, Mildred, then 11 years of age, went to live with her aunt in Caledonia. Norma Cheadle, a cousin with whom Mildred grew up, remembers her as self-assured, optimistic and intelligent. While training at Hamilton General Hospital, Mildred nursed John Hunter, a young fruit farmer who had been injured in a fall. They married in 1929 and went to live in Vinemount in the house John had named Morsgail Lodge after his childhood home in Scotland. John eventually gave up farming to open an insurance agency in Beamsville, and served as a councillor in Saltfleet township and as a Justice of the Peace. Mildred was an active volunteer with Easter Seals, the Society for the Prevention of Cruelty to Animals and numerous health organizations. She had a life-long interest in health care and education influenced, in part, by her earlier training and by the fact that her younger sister suffered hearing loss. “As a result, her sister received limited schooling and this always bothered Mildred,” Norma remembers. After John’s death in 1980, Mildred continued to handle her own financial affairs and make wise investments, Norma recalls. “She was very feisty and independent. 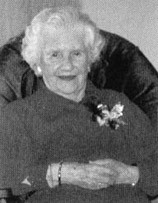 She lived in her own apartment at Atrium Villa on Main Street East.” At close to 90 years of age, Mildred died on October 15, 2000 after a fall. Mildred remembered various family and friends in her will, and made bequests to Caledonia Presbyterian Church Memorial Fund and St. Peter’s Hospital Foundation in addition to a generous gift to Hamilton Community Foundation.